This is the best Tandoori Paneer Tikka in the oven you’ll ever make at home! Same restaurant style taste, but roasted in a home oven. Making tandoori paneer tikka in the oven at home is serious business guys. And I’ve made sure this recipe is fool proof before I decided to share it here. Because you guys deserve only the best and nothing else! Honestly, I was a little nervous because tandoori paneer tikka has quite the God like status in our house. We are picky about our tikkas and we don’t like to mess around. 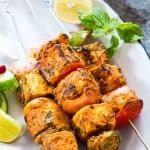 They have to be light, the paneer has to be soft, each piece of tikka has to be flavoured just right and marinated well and there should be char to lend that smokiness we love so much. How to make Tandoori Paneer Tikka in the Oven at home? Step 3: Place a cooling rack on a baking sheet so that its slightly raised. Place the paneer tikka skewers on the baking sheet like this ???? You can check out these skewers , cooling rack and roasting pan if you don’t already have one. Step 4: Bake/ roast for the best restaurant style tandoori paneer tikka in the oven! We are talking about a fiery red marinade for this paneer tikka but without any added colour because we are against food colouring mostly. You don’t need those chemicals unless you are making a red velvet lava cake (coming up!). But you do need Kashmiri Red Chilli Powder which has all the colour but no heat. What is paneer (cheese) made of? How do I make it at home? Paneer is literally a two ingredient cheese. You just need some full fat milk and a souring agent like lemon juice or vinegar to curdle it. I have an easy peasy, step by step tutorial to make paneer at home. What is Tandoori Paneer Tikka? 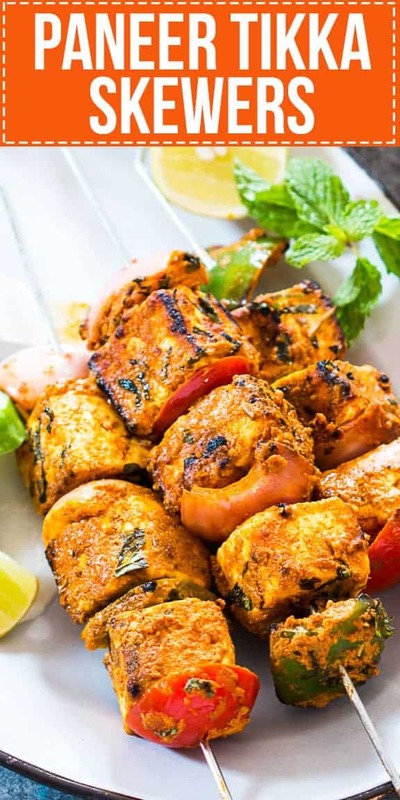 Just in case you aren’t familiar with our favourite appetizer, tandoori paneer tikka is marinated skewers of paneer which are grilled in a super hot tandoor (or traditional clay oven). It’s spicy, juicy, light and slightly smoky. Its like a vegetarian alternative to tandoori chicken, fish or prawn tikka if you’ve tried those. Can I make Paneer Tikka in a microwave? I’m sure you can but I’ve never tried it. I love the slow roasting that an oven gives, and the char on the paneer that a microwave will not be able to achieve. But both Sanjeev Kapoor and Tarla Dalal have recipes for a microwave paneer tikka that you can try. What do you think of this new question-answer format? It just makes me feel like I’m really talking to you guys. Because every time I check out a food blog, I always have a few potential questions about a recipe and sometimes I can get them answered and sometimes not. And I don’t like not knowing everything. Tell me what you think! BTW this is super approved by Denver. I’ve made this a couple of times and the last time we had this for dinner, he actually insisted I put it on the blog. Thats as big a thumbs up as any in my book ???????? Mix all the ingredients under marinade into a bowl and add paneer to it. 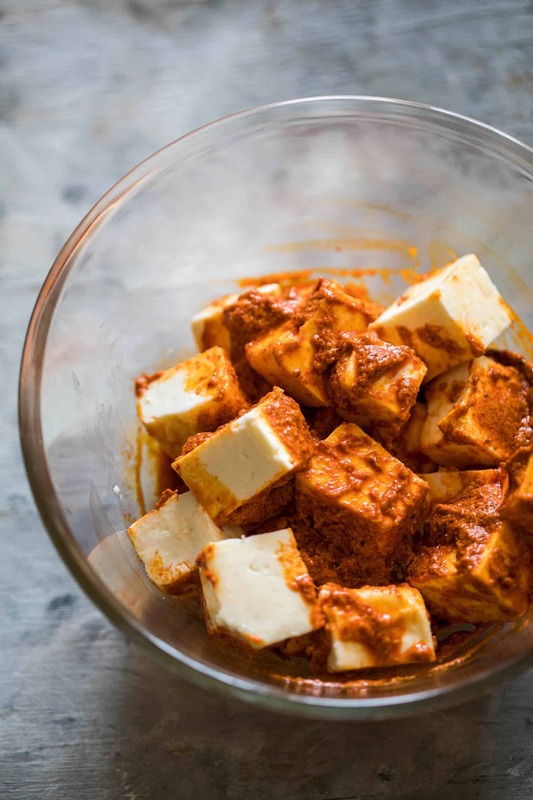 Toss the paneer in the marinade till the cubes are coated well. Cover and set aside for at least half an hour or up to two hours. Pre-heat oven to 220 C/ 430 F 10 minutes before ready to cook. Place a cooling rack over a roasting pan and set aside. 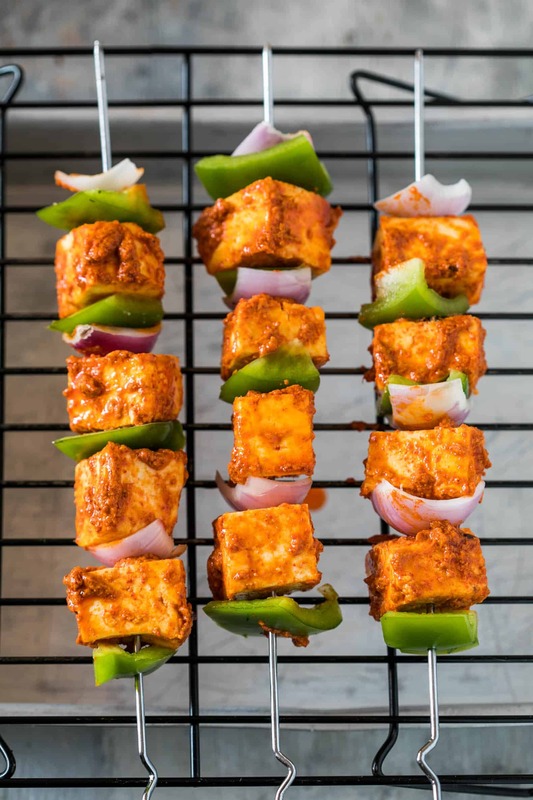 Skewer paneer cubes alternating with onions, capsicum and tomato (if using). This should make about 3-4 skewers. Place the skewers on the cooling rack and bake for 15 minutes, turning once half way. After 15 minutes, switch on the broiler (or only the upper element of the oven) and broil for 2-3 minutes till the paneer has a slight char on the surface. 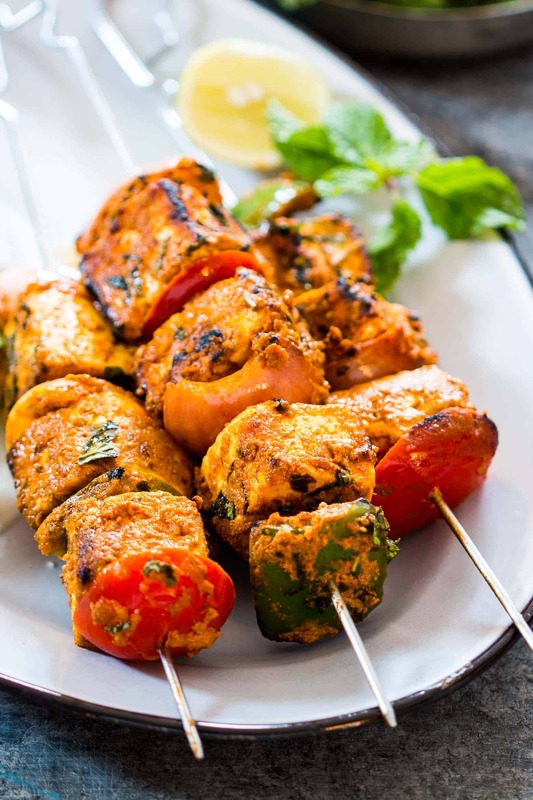 Carefully remove the roasting pan with the skewers out of the oven (the paneer tends to become really soft so be careful) and place the skewers on your serving platter. Top with chopped coriander and squeeze lime juice on them. Serve immediately with sliced onions. Very easy and delicious. I use less mustard oil but still tastes and cooks great. Thank you! Hi Naina, for the first 15 minutes please switch on both the lower and upper element. Once 15 minutes are up, move the tray to the topmost rack and only switch on the upper element to get a little char on the paneer. Made it today. It was a super hit. Thanks for the detailed steps and pics. So glad you liked it Shreedevi! I tried this recipe. But my paneer tends to get a little dry after putting in the oven? What can I be doing wrong? 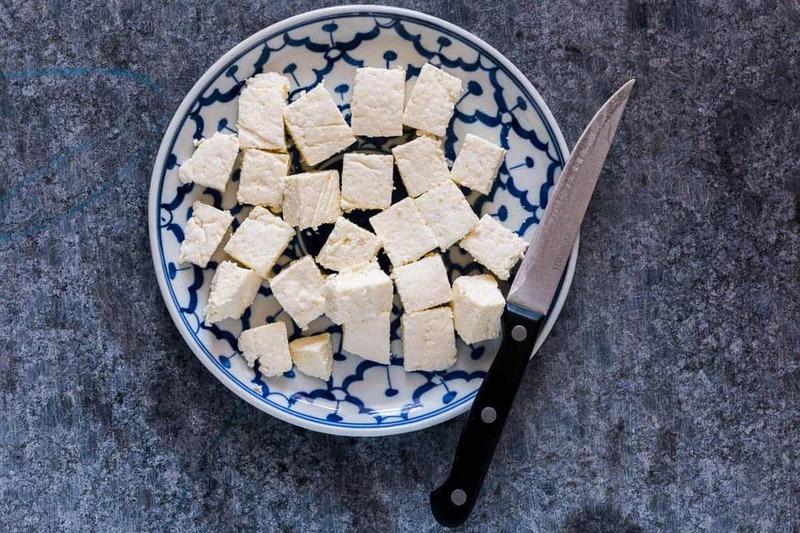 It could be the paneer itself – if the paneer is not fresh and creamy, it can tend to dry out. And I’ve made sure this recipe is fool proof before I decided to share it here. It’s actually foolproof which means its tested and can’t go wrong with it. Thank you so much for this great recipe! I will always follow this bake 15 and broil 2 method in the future. The paneer cooked and charred perfectly. Crisp and spicy on the outside and soft and fluffy on the inside. I couldn’t be happier with the results and my wife was very impressed. Thanks again! Thank you so much for sharing the changes you made. So glad both of you liked it! Can you marinate the paneer overnight? Does that effect the recipe at all? I need to follow . Tried this out. It was very tasty and tasted like the paneer tikka you get at Indian restaurants. It was too spicy for me though, I’ll use less chilly powder next time. Glad you liked it Astha. The potency of chili powder can differ from house to house. Hey Kanchan, I use a Morphy Richards 52 litre oven and I absolutely love it. Its a brand I stand by, and I would absolutely recommend it. Hey Bhargavi, that’d be really difficult to do. I recommend going through the user manual or calling someone from Morphy Richards to explain it to you. So it’s a nice recipe but I would add a tablespoon of chickpeas flour to help the marinate coat and stay on the paneer cubes. Thanks for the tip Chinmayi! Hey Donna! This really depends on the quality of paneer. But it won’t be as soft when you reheat it the second time. I tried this tonight, and it came out great! Thank you! Thanks Ella, I’ll try and add the quantity of salt in the future. Salt is a tricky ingredient though because everyone has different taste buds, but thanks for the feedback. Should i fry the paneer to make it more firm? and should it be fried prior to putting the marinade or after? You don’t need to fry the paneer at all. If your paneer is too soft, you can place it on a flat surface and place something heavy on top for a few minutes to make it firmer. what can I use in place of mustard oil? thanks! The paneer tikkas look scrumptious. I can live on paneer tikka and this looks like one of those which would be worth it. 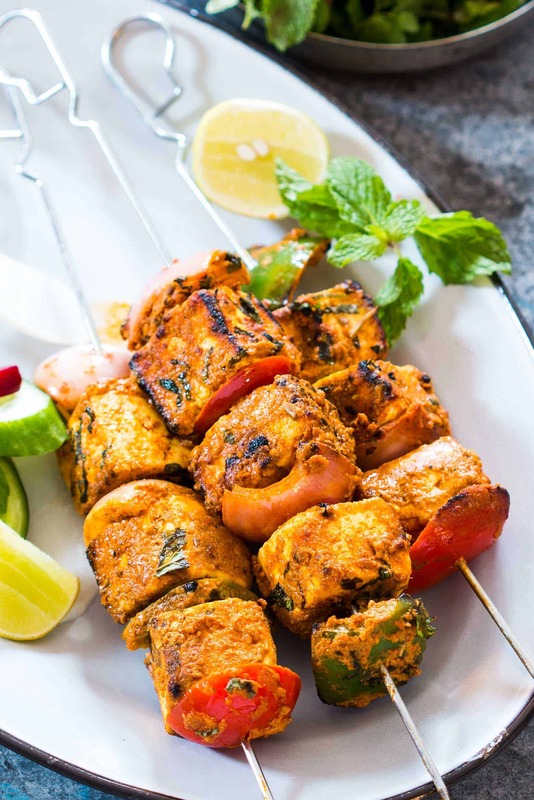 paneer tikka is a family fav as well. i have made sheekh kebab in the oven by putting them over a cooling rack and it really worked well. i will definitely have to try this paneer tikka soon. I always heard about this dish, but I never tried. I love Indian food, and It’s on the top of my list. I need to find out where to get paneer in Miami!!! U did not use salt in this recipe!